No worries, all of this is public knowledge now and might help others seeking for advise. Glad I could help and things are working fine for you now. collisions between mat_bullet <-> mat_concrete and mat_bullet <-> mat_bullet. That's it, let me know if things are still unclear. I understand that mat_bullet = "\Assets\Materials\bullet.mtl"
But about mat_concrete = the default material - Objects/default/editorprimitive ? Is there any document about this? Which project are you referring to? GameSDK? mat_bullet is not a material it's a surface type. Every material can have a surface type which describes physical properties of that material like the friction or sound obstruction. All surface type are defined in a xml file which can be found here Assets\libs\MaterialEffects\SurfaceTypes.xml. 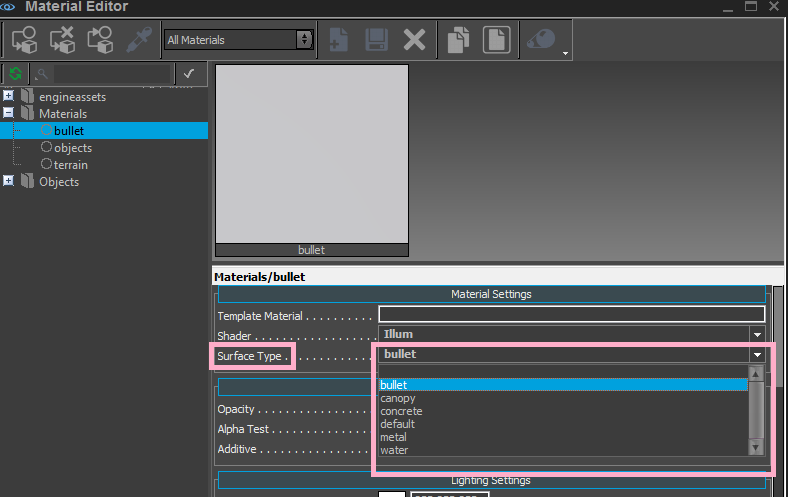 In that file you can also define your own custom surface types as we did with the mat_bullet. Those types then can be used to trigger certain sounds on collision, for example when the mat_bullet type hits a mat_concrete type you can play the "Hit wall"' sound and if the mat_bullet type hits a mat_wood type you can play the "Hit wood" sound, I guess you get the idea. You can have a look at the Assets\Libs\MaterialEffects\MaterialEffects.xml file to maybe get a better idea of the system. Hopefully a "UI connect sound to that mat type solution" will be available inside the Sandbox Editor in the future instead of manually adding lines externally in an Excel sheet / XML. mat_bullet is not a material it's a surface type. You are connected with some sorter of longer wind sound to trigger.As per my knowledge and experience it is around 5 to 6 seconds longer.